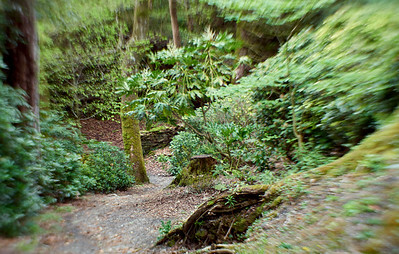 This is a brief photographic tour of the woodland area at Portmeirion, known as The Gwyllt. The tour doesn't feature every part of the Gwyllt but rather just picks out some of the interesting points. I won't attempt to name all the plants or pinpoint exact locations but it should give you an idea of what to expect. I've worked more or less in a clockwise direction starting from just beyond White Horses (it's not an exact route so please don't try to use it to navigate your way around!). 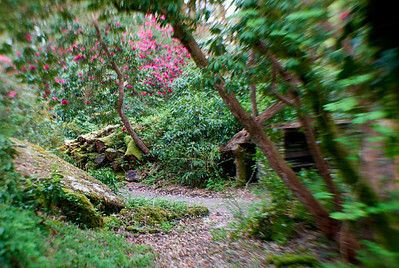 Some of the shots are deliberately soft focus to capture the atmosphere and mood of the woodlands. 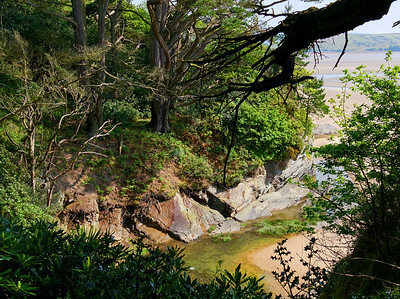 Walking past the main hotel at Portmeirion, along the old quay and underneath the archway of White Horses, you soon find yourself on a woodland path with the estuary on your left. 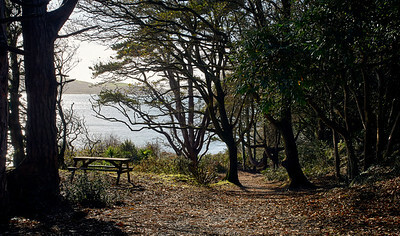 There are several benches and viewpoints dotted around the Gwyllt. 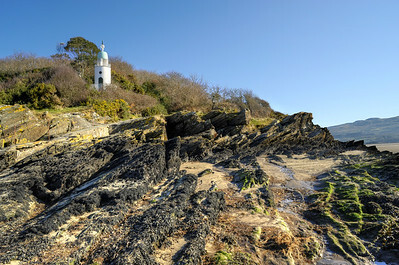 The lighthouse can be found further along the path from White Horses, it marks the southern most point of Portmeirion. Made from sheet metal, the lighthouse is a folly rather than a real lighthouse. Fairly soon after the lighthouse there is a path on the right that will take you back to the Chinese Lake along the side of the valley. 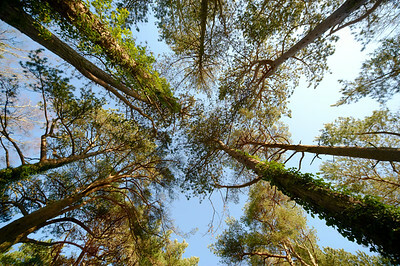 There are some beautiful trees in this section. 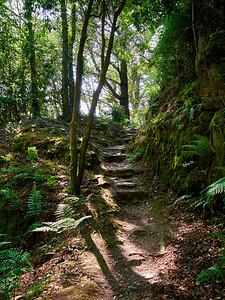 Heading down into the valley you can follow the small stream back up to the Chinese Lake or head along the path to the beach. 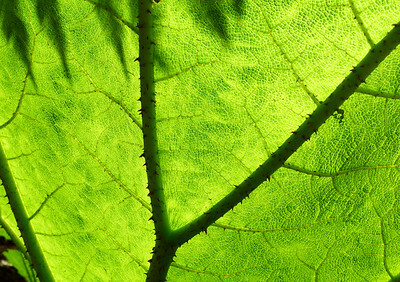 Near the shelter in the valley there are some fantastic Gunnera plants. 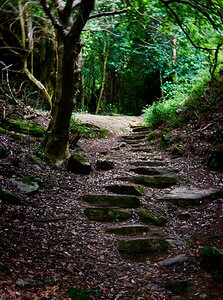 There are plenty of beautiful paths like this one, complete with stone steps, ferns and moss. 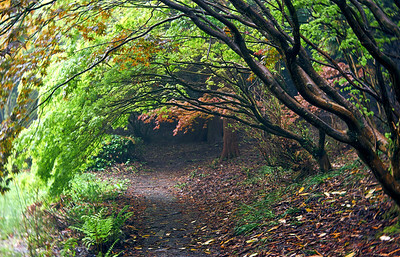 There is a path to a fairly isolated area within the Gwyllt known as the Ghost Garden. 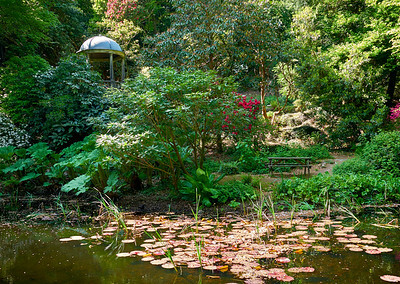 I've heard varying reasons why the Ghost garden is so named, including that the plants in that area tend to "swish" in the breeze, creating a ghostly sound. 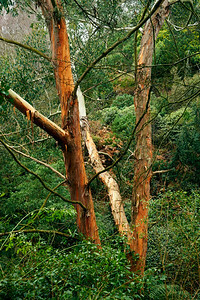 The official reason is that Clough named it to commemorate the garden of an old cottage in that area. 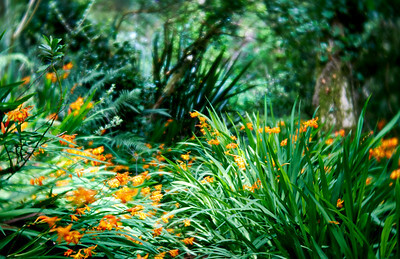 I think I prefer the "swishing" plants theory myself. Along with the main lakes in the Gwyllt, there are plenty of pools or boggy areas, just bursting with wildlife and colour. 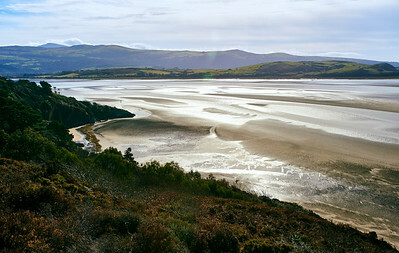 At the furthest point from the village there is a viewpoint where you can sit and enjoy the views over the estuary. 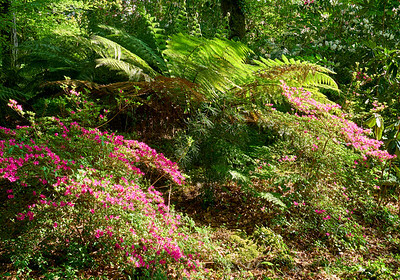 The sheltered location of Portmeirion and the Gwyllt provides the perfect climate for a fantastic and diverse range of plants. 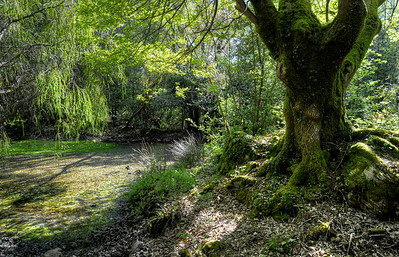 There are many little coves and gullies visible from the Gwyllt. Sometimes you can reach these at low tide by walking on the sand below (although recently the tides have shifted some of the sand into the middle of the estuary so these may no longer be accessible). 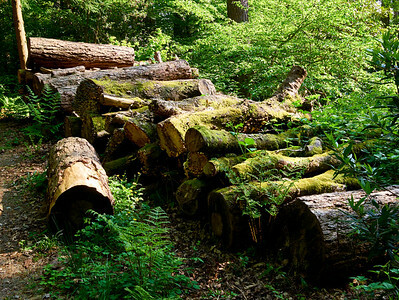 As with any woodland area, there are often stacks of wood from felled trees. 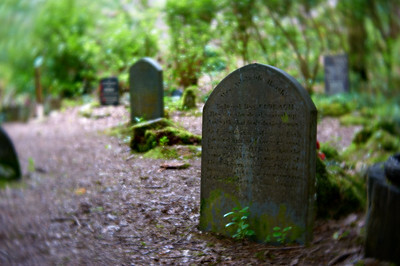 One of the more unusual areas of the Gwyllt is the Dog Cemetery. This dates back to the previous owner (before Clough created Portmeirion). It is reported that the lady preferred dogs to human company. There are a number of drystone walled shelters in the Gwyllt should there be a little shower while you're walking round. 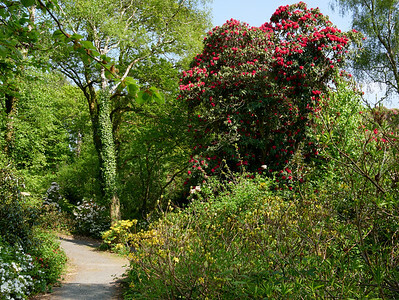 The Gwyllt at Portmeirion is famed for it's rare and unusual Rhododendrons. 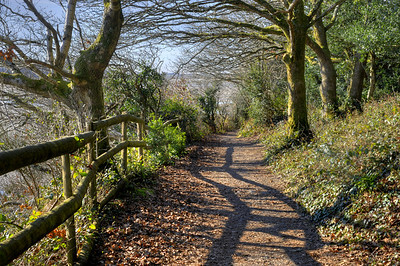 Whether you pick one of the main and relatively easy paths or go for one of the smaller more tricky tracks, there's no shortage of plants and wildlife to marvel at. 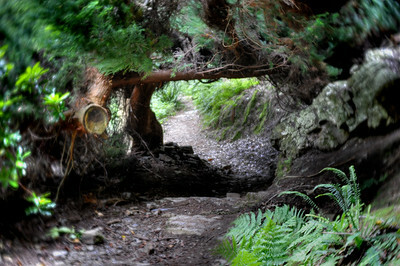 As you walk around the Gwyllt you'll find plenty of hidden paths inviting you to explore new sections of the woodland. 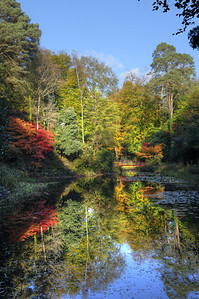 The Chinese lake is pretty impressive at any time but in the autumn the colours can be totally amazing. 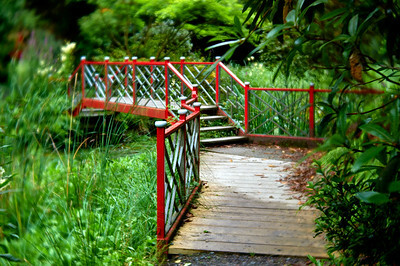 The Chinese Bridge over the largest lake at Portmeirion was designed by Clough's daughter, Susan (also famed for creating Portmeirion Pottery). An early morning view from the far side of the Chinese Bridge. There is an oriental styled shelter known as the Pagoda out of shot (above and to the right). 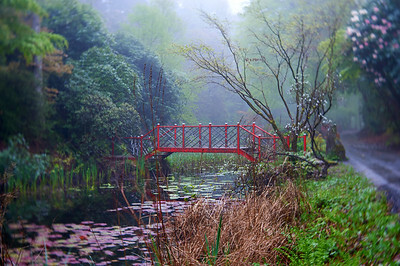 A misty morning shot on the path between Temple Pond and the Chinese Lake. 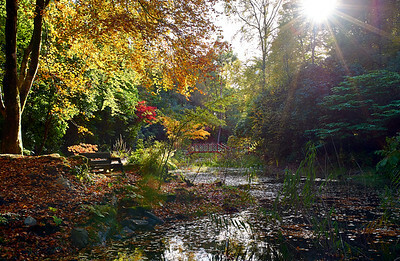 Late afternoon sunshine, looking from the village end of the Chinese Lake. 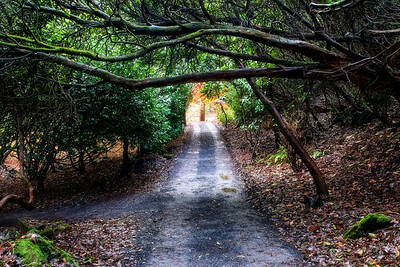 This path is part of the route for the Forest Train, just before it emerges from the trees at the Chinese Lake. 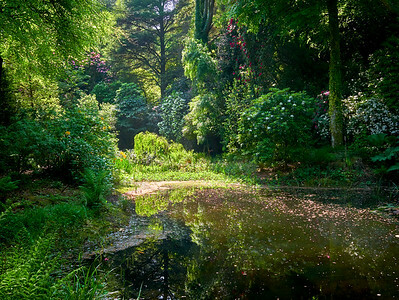 The smaller of the two main lakes in the Gwyllt is Temple Pond, complete with the classical styled temple top left of picture. 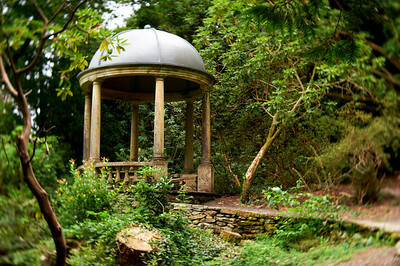 The shelter known as The Temple is a classical styled building with a domed roof, stone columns and balustrade. The area around the two lakes in The Gwyllt is easy to reach from the village, there's even a forest land train that runs past both lakes. 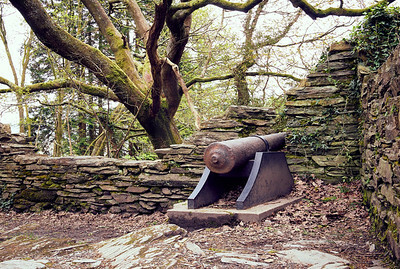 Situated high up in the Gwyllt (overlooking the Gazebo) are the ruins of an old castle, complete with a cannon.